If you missed my FB post this morning, 16 July 2014 is the date! It’s been a while since we had a 3-version release, but I’m so glad there’s a DVD! The play was really good this year, and of course it’s special cos it was held outside Tokyo for the first time. 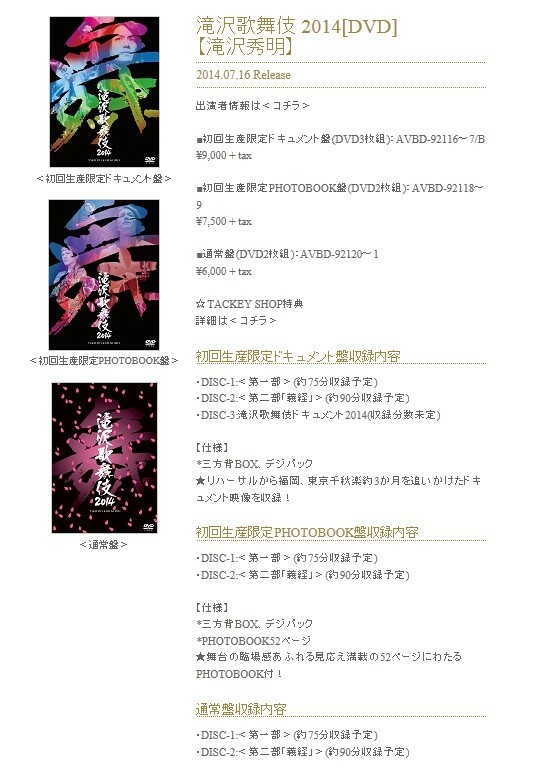 *If you purchase either “Documentary Edition” or “Photobook Edition” from Tackey Shop, you will receive a free gift of an ‘original travel case’, different designs, one for each edition. It’s hard to choose between A & B. I love behind-the-scenes, and Takizawa Kabuki documentaries have been the awesomest ever! Plus they are usually over 100mins. So it’s a MUST BUY, although the cover is my least favourite. “Photobook Edition” has the best cover (hadaka taiko!Takki~~) and there’s a 52p booklet. Imagine, a stage photo costs 500yen. This photobook might just be worth 26,000yen lol. Okay, Jacket C. Nice cover too, simple and pretty. But no bonuses, so C can be easily given up. Then there’s the Tackey shop goodies. “Original travel cases” are perhaps those where you can slot in your passports? I know it’s weird to say this, but I kinda hope they don’t look so nice, so that I won’t be tempted! Cos the discount at Amazon is too hard to resist! 23% is really quite a substantial amount. Well, it’s headache time for us again, but my advice is… if ‘die-die’ can only choose one version, please go for A! Update: Avex has gotten the Jackets A & B mixed up. In fact, the nice cover (hadaka taiko!Takki~~) is Jacket A Documentary Edition! Their initial post showed the wrong covers lol. Yay, mine was delivered from Amazon.co.jp this afternoon. I pre-ordered and received the 3-disc documentary version. Interestingly, though Amazon.co.jp also depicted Jacket A, mine instead came in the second cover, Jacket B, showing the shirtless taiko Takki, who is also similarly pictured on the inside folded disc holders. I won’t complain!